If you are using the Service as an Owner and your vehicle requires the installation of a HiyaCar Keyless Solution device in order for HiyaCar to provide you with our Services, the following HiyaCar Keyless Solution Terms and Conditions (the “HiyaCar Keyless Solution Terms”) shall, together with the Terms of Service (the “General Terms”), apply to your use of the Services. Any undefined capitalized terms used herein shall have the meaning ascribed to such terms in the General Terms. If you do not agree with any part of these terms and conditions, you should not participate as a HiyaCar Keyless Owner. HiyaCar reserves the right to modify the terms and conditions at any time. By allowing HiyaCar Keyless Solution to be installed in your car and continuing your participation as a HiyaCar Owner, you are accepting these, and any revisions to these, terms and conditions. The HiyaCar Keyless Solution Device is an electronic device that can be installed in your vehicle to help us provide the HiyaCar Keyless Solution Service. HiyaCar Keyless Solution devices are the property of HiyaCar and may be provided by us for each vehicle you enrol in the Service. HiyaCar retains all right, title, and interest in and to the HiyaCar Keyless Solution device and firmware. You may not reverse engineer, disassemble, decompile, alter, duplicate, translate, make copies, or create derivative works from the device or firmware, or otherwise attempt to derive the source code of the firmware. If applicable law permits such activities, any information discovered as a result of these activities must be promptly disclosed to HiyaCar and is the confidential and proprietary information of HiyaCar. You acknowledge and agree that in order for you to use the Service as an Owner, a HiyaCar Keyless Solution device may be installed and remain installed for the duration of your use of the Service. Only HiyaCar or a third party service provider that is authorized by HiyaCar may uninstall the HiyaCar Keyless Solution device from your Car. If the HiyaCar Keyless Solution device is uninstalled, including by a third party authorized by HiyaCar, you must immediately inform HiyaCar. If an unauthorized person, including but not limited to an unauthorized mechanic, removes, changes the wiring, or uninstalls the HiyaCar Keyless Solution resulting in the need to re-install the device, you acknowledge and agree that there will be a £100 re-installation fee that will be charged to your account. Prior to installation, Owner must disclose any third party devices installed in their vehicle and acknowledge that HiyaCar takes no responsibility for any liability arising out of the use or installation of third party devices in their vehicle. HiyaCar will not be responsible for any customer service needs that arise outside of the use or installation of third party devices. 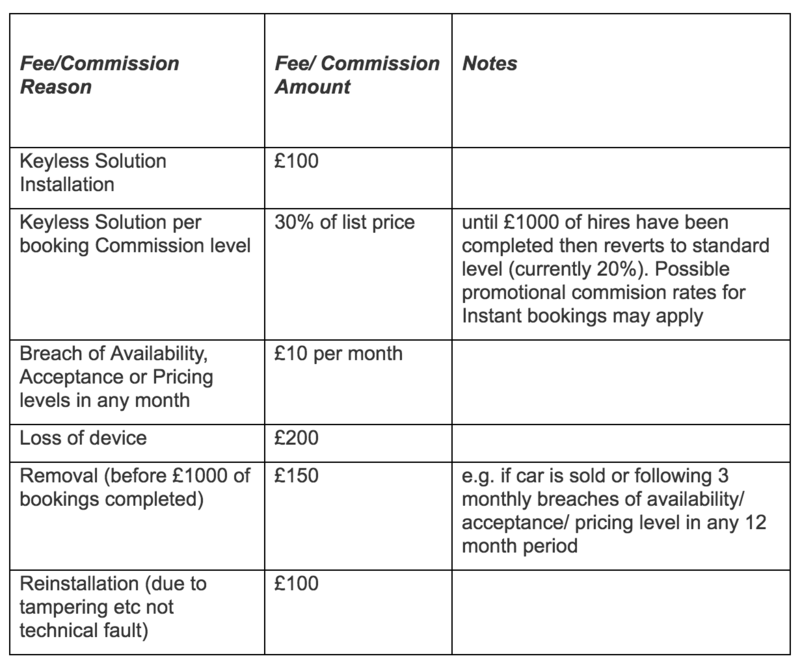 You hereby acknowledge and accept that you will be charged a one-time installation fee and accept a high HiyaCar commission level in accordance with the Fee and Commission Schedule (below). Should availability, acceptance or pricing not meet the above criteria in any month, HiyaCar reserve the right to charge the owner on a monthly basis as per the fee schedule. HiyaCar will make best efforts to alert owners to current and/or month to date availability, acceptance or pricing levels that are likely to incur fees. Subject to the terms and conditions set forth herein, you are hereby granted a limited right and license to use the HiyaCar Keyless Solution services (“HiyaCar Keyless Solution Services”) for use in connection with the Service. You may not use the HiyaCar Keyless Solution Services for any unlawful purposes or in connection with the placement of your vehicle on any other car-sharing services. When you use the Service, you must have a valid credit or debit card associated with your HiyaCar Account at all times. You must notify us immediately if and when: (i) you remove your vehicle from the Service, and (ii) when you sell or otherwise transfer ownership of your vehicle to a third party; provided, that, in each case, you acknowledge and agree that, it is your responsibility to have the HiyaCar Keyless Solution device removed (with potential charges as set out below) by an authorized party and promptly returned to HiyaCar. The Owner will continue to be liable for the charges below unless the device is removed or the new owner registers the car and a credit/debit card. For the avoidance of doubt, you acknowledge and agree that you will be charged a loss fee of £150 for each device not returned to us in good working condition within thirty (30) days of your vehicle being delisted. Please note that this includes vehicles that are rendered unrepairable in an accident, repossessed or impounded outside of a HiyaCar trip. Normal wear and tear and damage to device caused by an accident will not result in a charge. IF THE HIYACAR KEYLESS SOLUTION DEVICE IS NOT RETURNED AFTER NINETY (90) DAYS FROM THE DATE YOUR VEHICLE IS DELISTED, AND WE ARE UNABLE TO COLLECT THE £150 FEE ABOVE, YOU HEREBY AUTHORIZE HIYACAR TO TAKE ANY LAWFUL ACTIONS NECESSARY, INCLUDING LOCATING AND ACCESSING THE VEHICLE, TO REMOVE THE HIYACAR KEYLESS SOLUTION DEVICE AT OWNER’S SOLE EXPENSE. If ownership of a vehicle installed with a HiyaCar Keyless Solution device is transferred to a third party before the removal of such HiyaCar Keyless Solution devices OR NEW OWNER SIGNS UP, you as the Owner will indemnify and hold harmless HiyaCar and its subsidiaries, agents, licensors, managers, and other affiliated companies and their employees, contractors, agents, officers, and directors, from and against any and all claims, damages, obligations, losses, liabilities, costs or debt, and expenses (including but not limited to legal fees) arising from such transfer, including with respect to damage to the applicable vehicle or loss of data. During your use of the Services, HiyaCar warrants that the HiyaCar Keyless Solution Device installed in your vehicle will operate substantially in accordance with applicable documentation and be free of material defects. You acknowledge and agree that your sole and exclusive remedy with respect to the foregoing warranty is replacement of the nonconforming or defective HiyaCar Keyless Solution devices. Except as expressly set forth herein, the HiyaCar Keyless Solution and the HiyaCar Keyless Solution Service is provided on an “as is” and “as available” basis. Use of the HiyaCar Keyless Solution and the HiyaCar Keyless Solution Service is at your own risk. To the maximum extent permitted by applicable law, the HiyaCar Keyless Solution and the HiyaCar Keyless Solution Service is provided without warranties of any kind, whether express or implied, including but not limited to implied warranties of merchantability, fitness for a particular purpose, or non-infringement. Without limiting the foregoing, HiyaCar, its subsidiaries, its affiliates, and its licensors do not warrant that: (i) the HiyaCar Keyless Solution or the HiyaCar Keyless Solution Service is accurate, reliable, or correct; (ii) that the HiyaCar Keyless Solution or HiyaCar Keyless Solution Service will meet your requirements; (iii) that the HiyaCar Keyless Solution Service will be available at any particular time or location, uninterrupted, or secure; (iv) that any defects or errors will be corrected; or (v) that the HiyaCar Keyless Solution or the HiyaCar Keyless Solution Service is free of viruses or other harmful components. You acknowledge that the HiyaCar Keyless Solution relies on location information, such as GPS and mobile connectivity. Mobile connectivity and satellite signals are dependent on a number of factors not within HiyaCar’s control including weather, topographical changes, changes to and support of mobile network technologies, the functionality of various satellites, cell towers, clouds, and other factors. You expressly agree to indemnify and hold HiyaCar harmless from any and all claims or damages that result from the HiyaCar Keyless Solution not working, malfunctioning, or failing. Although the HiyaCar Keyless Solution has Enhanced Security features, HiyaCar makes not warranties or guarantees that your vehicle will not be stolen or damaged. HiyaCar will use all commercially reasonable efforts to retrieve the Owner’s vehicle to the extent that a security incident occurs during a HiyaCar trip. Security incidents that occur outside of a HiyaCar trip will not be covered by HiyaCar’s Insurance Policy and should be covered by an Owner’s own comprehensive insurance coverage. The HiyaCar Keyless Solution operates by drawing power from the vehicle’s battery power, and you acknowledge and agree that the performance of the HiyaCar Keyless Solution may be affected by the performance or capability of your vehicle’s battery. Care should be taken in using the HiyaCar Keyless Solution device in vehicles that have old or weak batteries, or that may go extended periods without being driven. Data collected from a HiyaCar Keyless Solution device may be useful in determining the cause of an automobile accident. If you are in an accident, you may have a legal obligation to preserve the information on the device. This information may be sought by opposing parties in a civil lawsuit or by police when investigating the cause of an accident, or we may be legally obligated to provide such information in response to a court order or as otherwise required by law. In connection with your use of the HiyaCar Keyless Solution Service, you may have access to certain driving information or data about your vehicle and its location. You may not use such information or data for any unlawful purpose or otherwise in connection with any third party car-sharing or rental service. You expressly agree to indemnify and hold HiyaCar harmless from any and all claims or damages that result from your use of such information or data. Owner agrees not to use the HiyaCar Keyless Solution for any unlawful or abusive purpose or in any way that interferes with the HiyaCar Keyless Solution. Customer will comply with all laws while using the HiyaCar Keyless Solution and will not transmit any communication that would violate any national or local law, court, or regulation. You may not resell the HiyaCar Keyless Solution Services or the HiyaCar Keyless Solution device. By using the Services and/or the Devices, you agree to abide by the terms and conditions of any software license agreements applicable to any software associated with the HiyaCar Keyless Solution device or HiyaCar Keyless Solution Services. Once the HiyaCar Keyless Solution is installed and activated, by default the booking mode will be set to “Instant”, which means that any booking requests made during periods when the car is available for hire will be automatically accepted without any intervention by the owner. HiyaCar may from time to time incentivise or reward such bookings with a reduced commission rate which will be communicated separately and automatically applied where applicable. Owners are not obliged to keep Instant booking on at any time. HiyaCar takes no responsibility for any liability arising out of Instant booking being activated on bookings. In the event of a conflict between these HiyaCar Keyless Solution Terms and the General Terms, these HiyaCar Keyless Solution Terms shall control with respect to the use of the Services.